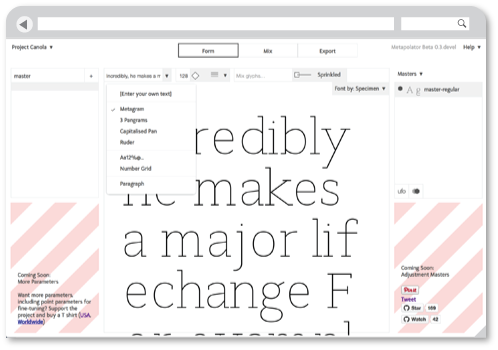 “Metapolator is an open web tool for making many fonts. It supports working in a font design space, instead of one glyph, one face, at a time. With Metapolator, ‘pro’ font designers are able to create and edit fonts and font families much faster, with inherent consistency. They gain unique exploration possibilities and the tools to quickly adapt typefaces to different media and domains of use. With Metapolator, typographers gain the possibility to change existing fonts — or even create new ones — to their needs. Fonts can be drawn with existing traditional font editors and loaded into Metapolator using the UFO format. Metapolator can interpolate them in a typical way, with unlimited masters and axes. It can also import fonts that are drawn the Metapolator way, with glyphs drawn as separate and overlapping contours. They mimic strokes with pairs of points along each edge. Glyphs are often drawn this way already because it is a good way to draw shapes resembling strokes of pens. When imported, these drawn outlines are converted into real stroke objects. The Metapolator project is a free, libre, open source project that is developed by a community of designers and developers. It began in March 2013 when Simon Egli (a graphic and type designer from Switzerland) and Dave Crossland (a software freedom activist working to free typography) met in New York City to discuss the Metaflop project that Simon was contributing to. 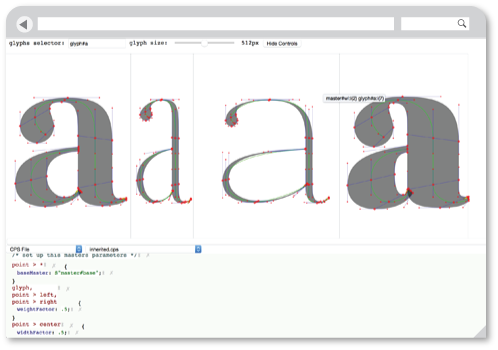 Metaflop is a web-based graphical user interface to the Metafont parametric font programming language, allowing non-programmers to adjust the parameters of a metafont intuitively. Simon had realised that the Bezier contours typically drawn by type designers, and stored in the UFO GLIF XML format, could be converted into a Metafont stroke element, if they simply have an even number of points. Dave wondered if this could become a powerful new way to develop typeface families. It would combine the parametric power of Metafont with a graphical interface to glyph drawing. This could overcome the inherent limitation of inputting text for outputting graphics, which has prevented Metafont from being truly useful for type designers. Simon returned home to Switzerland and founded the Metapolator project to pursue this vision. He began a PHP codebase and posted some experimental results on Tumblr. Dave and Simon attended the Libre Graphics Meeting 2013 in Madrid in April to begin a new prototype, mfg. This used a Python web server to connect Robofab, Metapost, mf2pt1 and FontForge to a web UI that used paper.js. Over the following year, the project grew to include new contributors, including Vitaly Volkhov (a Python developer in Ukraine) Wei Huang (a graphic and type designer in Norway) and Nicolas Pauly (a graphic and type designer in Lyon.) With a working prototype in hand, Simon began work on a new Sans Serif family, codenamed Sean Sans. Simon, Wei and Nicolas began developing new font families, and Peter began the design of the new Metapolator application. Lasse led the development of the core CPS technology engine, with assistance from Reuben Thomas and Ben Martin, software developers who had contributed to FontForge. The team met at the automatic type design conference at the Atelier National de Recherche Typographique in May in Nancy, France. Development continued over the summer, posting work in progress and discussions on the Metapolator community on Google Plus. The community grew to include contributions from Jeroen Breen, Coen van der Kamp and Felipe Sanches who implemented a working prototype of the UI in close collaboration with Peter. This was presented at the Libre Graphics Meeting 2015 in Toronto in April 2015. The future of Metapolator is to continue implementing what has been designed, to set the trend for the next generation of typeface design. We hope you'll join us.